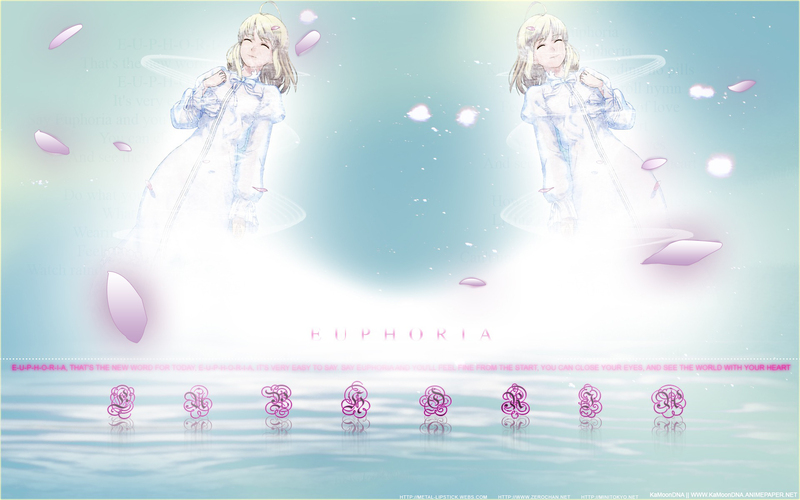 Minitokyo »	Fate/stay night Wallpapers » Fate/stay night Wallpaper: E.U.P.H.O.R.I.A. Don't makes these colors feeling you euphoric ? Aren't you another person when you're happy? Smile, tomorrow can be worse! About it: I found a scan here on AP(http://www.animepaper.net/gallery/scans/Fate-Stay-Night/item268910/), then I edited in Photoshop, and now I show to everyone my work^^ First time I wanted to do a wallpaper with a wedding, but I wasn't lucky; I didn't found an image with a white bride... It was easy to make this wallpaper, it took me 3 hours, in adobe photoshop cs 2. On the background are the lyrics of the song "Euphoria" by Michael Jackson. I never listened to that song because I don't listen to pop, but I found the lyrics fitting this wallpaper.